The best looking solar pool heaters are not just about the panels. The plumbing is a key component that can easily be botched. This is a masterful job. While all of our installers do great work, I can often tell which installer did a job by the plumbing. Sometimes it’s the valve manifold at the pool equipment pad and sometimes it’s the roof work. While he likely trained the person doing the actual work on the roof, I’d call this a “Danny job,” recently installed in Cape Coral, FL. Because two lengths of solar pool heating panel were combined in this system, it required that a “common high” be installed. This entails making sure that the water leaving the shorter panels reaches the common high point in the system, which equalizes pressure and keeps the flow rate uniform among panel sizes. 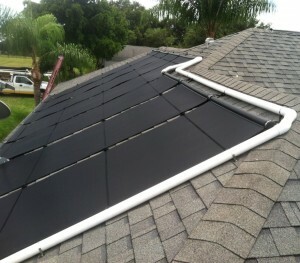 We use a “zee” plumbing technique to tie two solar panel lengths together. Also of note are the two 45º fittings at the upper right. This bend could have been accomplished with a single 90º fitting, but using the two 45’s follows the hip line and avoids the 90 sticking out over the hip. You might think this is obvious, but believe me — I’ve seen some pretty embarrassing plumbing jobs done by others. The two 45’s also reduce pressure loss slightly, maximizing flow rate. Since we are often maximizing the amount of solar pool heating coverage on a roof, we bump up against hips often, making masterful plumbing techniques an important skill for solar pool heating installers. Tile roofs present even greater challenges with hip caps that protrude from the roof plane. In this case we need to perform a “hump jump,” which is one of the hardest plumbing techniques to learn, using at least 9 fittings to get the feed and return lines around corners properly.